Mohanthal, treat for your eyes and palate. 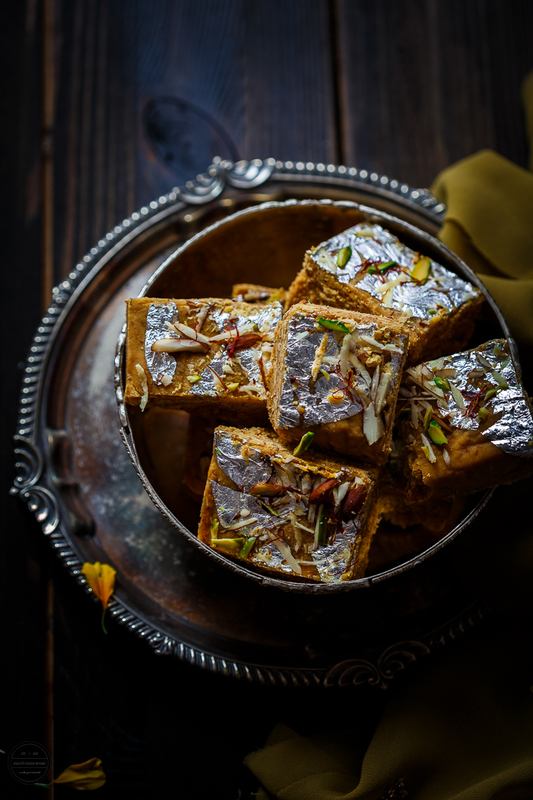 This sinful and scrumptious chickpea flour delight fudge must for Diwali celebrations !! 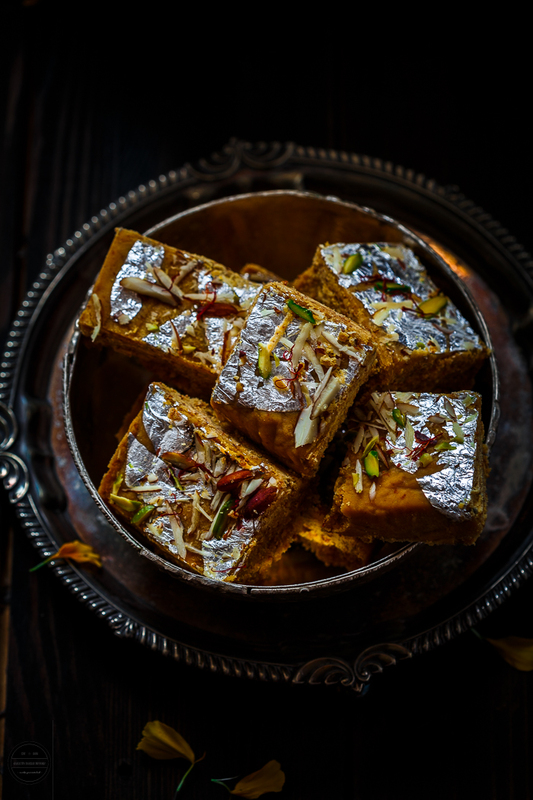 I used to devour this sweet, made by my mum every Diwali in India. 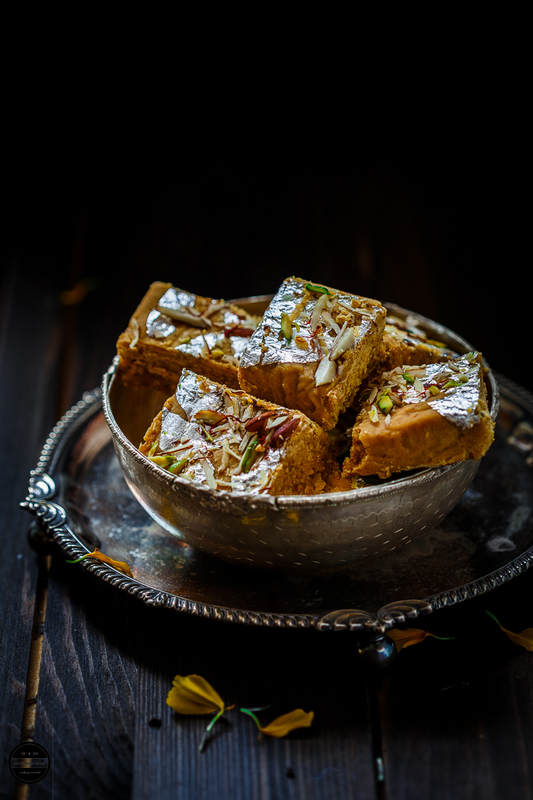 Mohanthal is a very popular Gujarati sweet which is mainly consumed during Diwali festival. 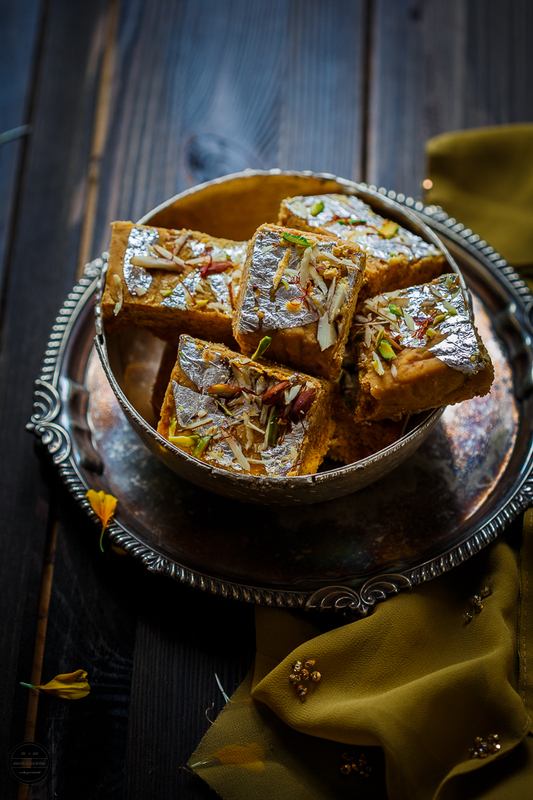 This sinful and scrumptious melt in your mouth fudge made with chickpea flour, sugar, ghee and khoya. To the warm milk add 1/4 cup of ghee, remaining ghee used later.Add milk and ghee mixture to chickpea flour and mix. Leave covered for half an hour.In a pan, mix sugar and water and add saffron and leave aside. Do not heat yet.Rub chickpea flour mixture with your fingertips to make crumbly. Sieve chickpea flour mixture in a special mohanthal sieve.In a heavy bottomed pan, heat remaining ghee and roast chickpea flour for at least 35-40 mins on a very low heat until a roasting aroma is reached and the flour should be a light brown colour. DO NOT BE HASTY during this step.After roasting, add grated mawa to mixture and roast for a further 7-8 mins. Turn off the heat and leave the mixture aside.Start making the sugar syrup on medium heat. Heat syrup until sticky between your fingers (looks like threads of sugar) Add saffron threads, leave few for garnishing.Add cardamom, nutmeg and mace powder to flour mixture and then sugar syrup. 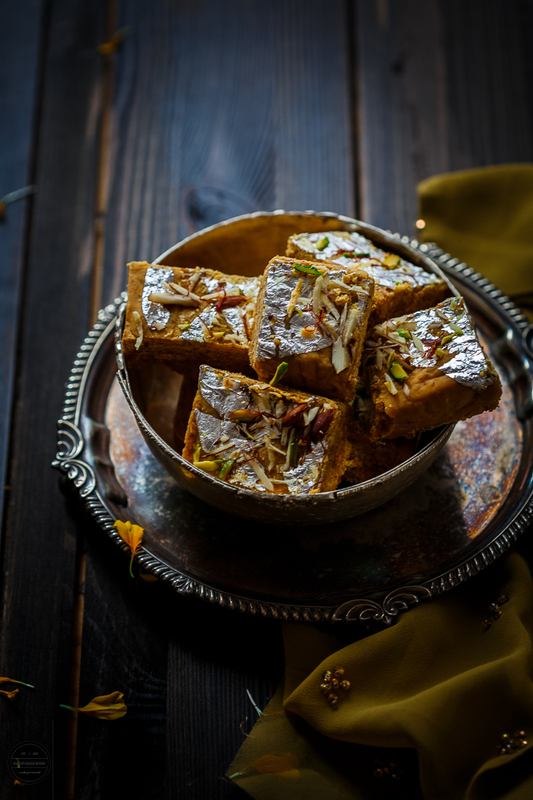 Mix very well.Pour mohantaal mixture in a greased tray and garnish with almonds and pistachio. Allow to set for around 6-7 hours. Cut Mohanthaal in the desired shape.Enjoy! Celebrate - Navratri/Diwali guest host by Nayna , event by JCO ( me ). 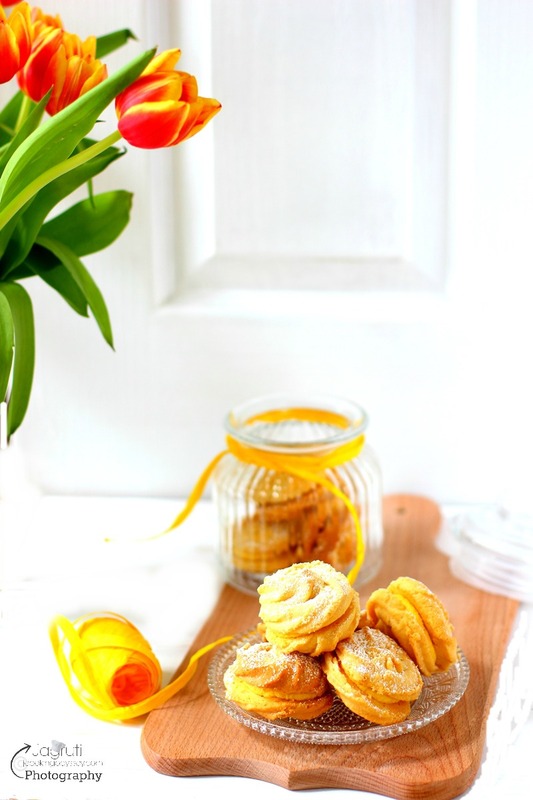 Know your floures - Chick pea flour guest host by Anshie Dhar event by JCO ( me ). Know your natural sweetness - white sugar guest host by Sharanya, event by JCO ( me ). and my own event Grand Festive Feasts . Wow Jagruti, they look so perfectly mouthwatering!!! very nice texture..just perfect! perfect recipe to make this diwali..lovely presentation too! Diwali wishes to you and your family.Cant resist to this beautiful mohanthaal. belated diwali wishes dear....v tempting n irrestible,,,havent taste this before! 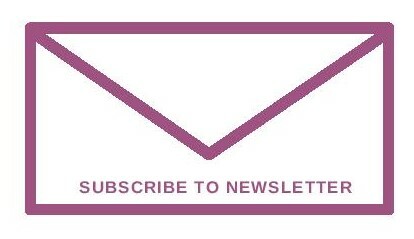 Hi, thanks for your comment. when you add milk and ghee, don't leave mixture to sit but straight away mix with your fingers and roast it. Hope this helps. Made Mohanthal today and waiting for it to cool down. What should be the consistency of sugar syrup?One string or more? Hi Sheekha, it should be between one and two.